Yahushua as another example, waited until he began his earthly ministry (“being around 30 years of age” Luke 3:23) before he was baptized by water and the sacred ruach (spirit). Yet, he knew the truth long before he reached the age of 30. Indeed, the messiah, the savior of all who shall be saved, never baptized anyone during his entire earthly ministry. Further, Abraham, Isaak, Jacob, and many others who are declared to be righteous and heirs to the eternal inheritance never underwent water baptism. Instead, they used as a seal the act of fleshly circumcision. Although they were circumcised of the flesh they were setting themselves to be circumcised of heart (an inner spiritual act when quickened to eternal life). The same holds true for water baptism, a fleshly token, setting oneself to be baptized with ruach (spirit) and fire. Nevertheless, these different baptisms were all symbolic of the resurrection (water baptism) and the baptism of the sacred ruach (quickening to eternal life) done in the sacred name on the higher level. Also note that water baptism alone is not enough. Those baptized by John’s water baptism were found in need of being baptized a second time by the sacred ruach in the name of Yahweh. The simple fact of the matter is that the act of water baptism today is under the same requirements as fleshly circumcision of the past. As Saul tells us, circumcision of the flesh is not the important circumcision but it is the spiritual and inward circumcision of the heart. • Why are women not capable of being circumcised? • Why were the Israelite men not circumcised during their 40 years in the wilderness? • Why did he call Abraham while Abraham was still uncircumcised? • Why was Abraham declared justified long before he was fleshly circumcised? • Why was no one before Abraham circumcised? The same is true of water baptism. Before the time of John the Baptist there was no formal command from Yahweh to perform this fleshly act without being connected with the Tabernacle/Temple. Abraham was determined to be circumcised (i.e., symbolically of heart) and righteous while in his physical uncircumcision because of his trust in Yahweh (Romans 4:1-12). No one is declared righteous by Yahweh because he is baptized by men (whether by water or ruach ), but man is justified by his trust in Yahweh. At the same time, water baptism profits you nothing if you transgress the Torah of Moses (and keep in mind that John the Baptist performed his water baptism under the Torah of Moses and the apostles performed baptism on those who were not under the Torah of Moses but still under the Torah of Trust). Per our example from Scriptures regarding fleshy circumcision, water baptism is nothing and not being baptized is nothing, but keeping the commandments of Yahweh and obeying his voice is something. Furthermore, who among us today has either the authority or is in possession of ruach in order to baptize with water or the ruach? John the Baptist, the apostles, and other disciples who baptized in the past were under direct orders from Yahweh or Yahushua the messiah to baptize (John 1:33; Matthew 28:18-19). • Who has this authority to baptize in our present day, for all who originally held this authority have died. • Who can rightfully claim direct authority from those who had authorization or through one of their agents? • Do we have authority to baptize ourselves? • Can we give ourselves this authority? Try as one may, there cannot be found one passage in Scriptures that gives the authority for anyone to perform baptisms today. Pointing to passages where the apostles were given direct authority cannot be used to give ourselves authority, no matter how much wishful thinking we may have. If Yahweh wants us to pick up the ceremony of baptism he must authorize someone to carry out the act, just as John the baptist and the apostles were duly authorized. Only true baptism will permanently profit a person. This baptism comes after a person’s death (loss of their corruptible body) and resurrection (obtaining an incorruptible body) and then their quickening into eternal life. Yet, the first part of baptism, i.e., the resurrection (= water baptism), also does not profit you if afterward you then reject repentance and refuse Yahweh. Should we not be baptized in water and ruach now? Of course this representative act would be good, but it would only be of value if we are prepared to take on the responsibility of such tokens and seals. It is a professing of one’s trust in Yahweh, as circumcision was a token for Abraham. But, this brings us back to the question of who will baptize us? Who has the authority? Herein lies the rub. If we baptize ourselves without authority, what force is it and in what trust do we honor ourselves? We should not forget that King Saul, becoming impatient for the arrival of Samuel, the priest and prophet of Yahweh, performed sacrifices in the name of Yahweh without authority. As a result, Saul lost his kingdom (1 Samuel 13:7-14). Do we really trust if without an authorized agent from Yahweh we give ourselves authority and baptize ourselves in the name of Yahweh? Is a person condemned if they are not baptized by men with water and/or ruach? Certainly not! Many who lived and have died before Abraham never experienced water baptism or fleshly circumcision, but none of these (e.g., righteous Abel, Enoch, and Noah) shall be rejected on that basis. Abraham was never baptized with water, neither was Isaak nor Jacob, King David, and many of the prophets named in the Old Testament. Yet, they are assured to receive eternal life when they will be resurrected in the First Resurrection. Water and ruach baptism by men can come only by authority of Yahweh and is to be used as a seal of trust in Yahweh, as a token of the great baptism that is yet to occur at the end of this world-age. It is acting out prophecy. All baptism is a sign of our entrance into the body of the messiah in this age and points to the eternal membership into his body after our quickening into eternal life. 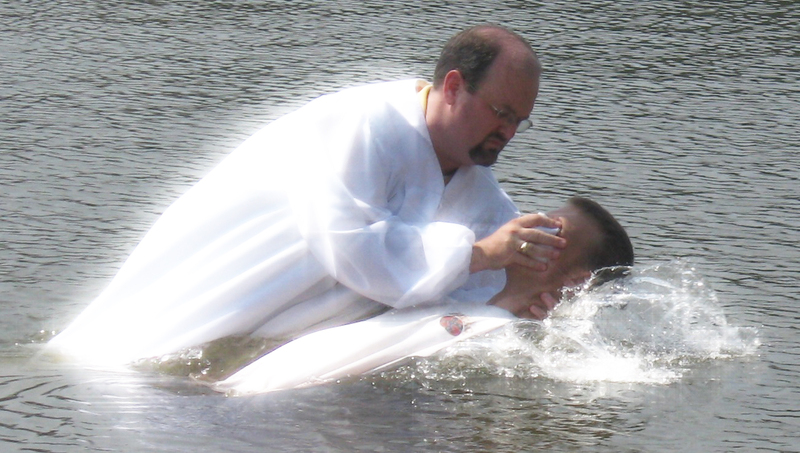 Water baptism is a type of fleshly circumcision for all nations, and is an act of repentance. It is not a burden to be placed on a person, which if not performed removes one from salvation. The baptism we must watch for is the eternal baptism by Yahweh—when he baptizes us with the sacred ruach (quickens us into eternal life) and then perfects us by the sacred ruach of fire (Matthew 3:11). Whether one trusts or not, all will undergo baptism. With the First Resurrection and Second Resurrection all will be resurrected into the body of the messiah (death/resurrection = symbolic water baptism)—for all will know Yahweh from the least to the greatest. All shall be baptized with the sacred ruach, but many shall turn away from the truth even after receiving this gift (Hebrews 6:1-8; Proverbs 1:20-33; Joel 2:28-32; Acts 2:14-21). Yahweh’s fire baptism will also be performed on all. For those not trusting, the fire baptism will condemn them; for those trusting, it will give them perfection. This entry was posted on 03/25/2012, 9:53 pm and is filed under Baptism, Grace, Heaven, Hell, Religion, Salvation, Yahweh. You can follow any responses to this entry through RSS 2.0. You can leave a response, or trackback from your own site. I don’t know who you are, but I love your teaching so much! Well said. I appreciate your light touch. Make sure you click the “Follow Blog” button in the upper right corner so you don’t miss any straight-shooting’ talk from the Ranger.